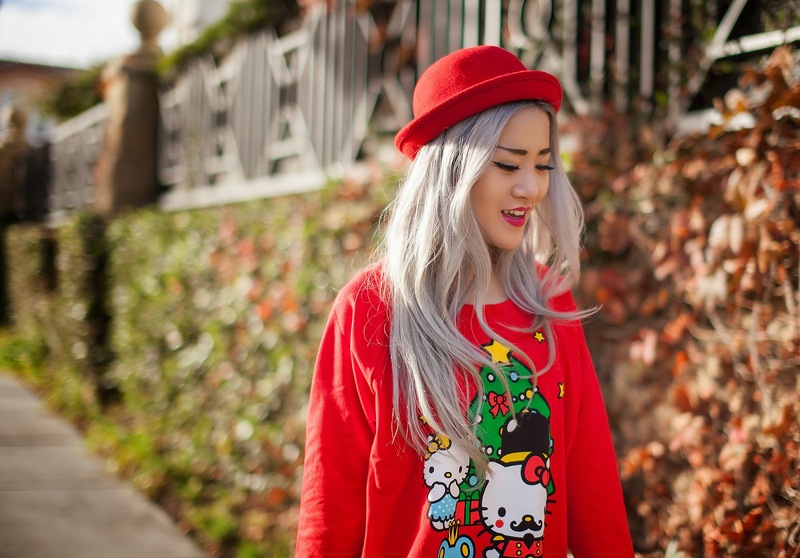 Japan LA x Hello Kitty sweater (c/o). Japan LA x Hello Kitty leggings (c/o). Kat Maconie shoes. ...fall. It's beginning to look a lot like fall. Haha. As you can tell by the colors of the leaves in these photos, we never really get bare branches or brown leaves. This might be only the third time or so that I've seen red leaves this year with my own eyes. Buuut this is Christmasy enough for me! Remember how I modeled all that super kawaii, adorable, make-me-melt stuff for Japan LA a few months back? Here's some more equally adorable stuff from their collaboration with Sanrio and Hello Kitty...and it's Christmas-themed! I normally don't wear stuff this cute but the holidays always bring up my mood to lvl 9000 and I just feel happy all the time and I wanna bake a cake filled with rainbows and smiles and everyone could eat and be happy. Love the sweater, it's so cute! Love the shoes! So gorgeous. That line from Mean Girls haha, I never dress for holidays either but I would so wear this! It looks perfect on you. Haha THANK YOU FOR RECOGNIZING THE QUOTE! I feared no one would. Love those shoes! They look great, what a cute outfit! It is such a cute sweater! Where can I buy it? I really want one for Christmas! It is such as cute sweater! Where can I buy one? I really want one for Christmas!